Whether you’re an experienced traveler or only take a few trips a year, you’ve probably enjoyed staying at a few hotels. But the Marriott Marquis Houston, the venue for Acumatica Summit 2019, is not just any hotel. It offers an amazing experience you won’t want to miss. If you’ve ever needed an excuse to stay in a AAA Four-Diamond hotel, then Acumatica Summit 2019 is a great one. 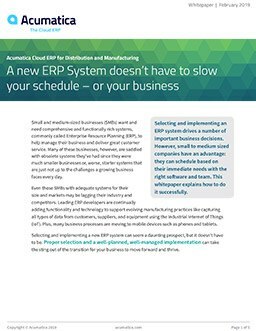 Our annual cloud ERP event (which you can register for right now!) is slated to take place January 27-February 1, 2019 in Houston, Texas. And our venue is the fabulous Marriott Marquis Houston. I don’t know about you, but I’m ready to go right now! Since we must wait, let me tell you about the hotel and what you can expect during your stay. Acumatica Summit 2019 promises to be another amazing cloud ERP experience, and our team is already working hard on the agenda. From breakouts to general sessions, and from meals to entertainment, nothing escapes our attention. If it has to do with our cloud ERP software, and our customers, partners, and developers will benefit from it, then we make sure it’s included. Training tracks (which are geared specifically for every attendee; this will be our fourth year we’ve provided customer-only training tracks), a partner Solution Showcase, invigorating guest speakers, and more are all taking shape, and this includes our venue. We chose the Marriott Marquis Houston for many reasons. Here they are in random order (because every reason is equally important!). As we discussed in our recent post highlighting Houston, we found the city to be a perfect and easy location for members of our cloud ERP community to get to. Centrally located, it’s easily accessible from both coasts and has three airports: William P Hobby Airport (HOU), Ellington Field (EFD), and George Bush Intercontinental Airport (IAH). Just like Houston’s accessibility, the Marriott Marquis Houston is easily accessed and centrally located in the city. Attendees will be steps away from numerous visitor attractions (which I’ll discuss in more detail in an upcoming post), but the services and amenities at the hotel may just convince you to stay put during our week-long, cloud ERP software conference. Pictured: A well-appointed Marriott Marquis Houston guest room with king bed. Each room at the hotel offers a different view of the active city, along with a 55-inch LCD TV, connectivity plug-in panel, and WiFi. Luxurious bedding and spa-quality bathrooms await you after a long day of networking and cloud ERP learning at Acumatica Summit 2019. If you register early, you can take advantage of our special room rates negotiated for this event; you can also have first choice of guest rooms before they’re sold out. Pure. It’s new, and it’s luxurious. The Marriott Marquis Houston’s spa is the place to go when you need some pampering during your stay. You can choose from an array of options, such as massage, facials, manicures, and more. Because this may be a popular pastime during down time (and because reservations are required), you’ll want to book any appointments early. However, if you’re someone who relaxes by working out, then the 7,000-square foot fitness facility will be a slice of heaven. It features floor-to-ceiling windows and every piece of equipment you need for a full exercise session. Open 24-hours a day, seven days a week, the Marquis Fitness Center and fitness classes are complimentary to all hotel guests. Pictured: The Marriott Marquis Houston’s Lazy River and Infinity Pool. You see it, right? This beautifully designed hotel has a heated Lazy River (an amazing amenity not often seen outside of Las Vegas) shaped like Texas…on the rooftop deck. Right next to it is the relaxing (also heated) Infinity Pool. And there’s a Whirlpool. I don’t think I need to say anything more. Lack of food and beverage is not a problem at our Summits. In fact, it’s just the opposite! There are times, however, when you might need to host a client dinner, have free time for a personal meal, or just need a coffee (or two, or three). The hotel offers six options including Biggio’s (American, Sports Bar), Cueva (Tapas, Wine Bar), High Dive (American), Texas T (Coffee House), Walker Street Kitchen (American), and Xochi by Hugo Ortega (Mexican). For places outside the hotel to eat, stay tuned as I’ll be diving into Houston’s top places to eat in a future post. I can say, though, that you won’t be disappointed in your options, whether at the hotel or out on the town. I’m ending with the more business-related amenity, but our premier cloud ERP event requires ample meeting space for our many breakouts, general sessions, and training tracks. And the Marriott Marquis Houston has plenty of room: 52 event rooms and 38 breakout rooms for a total of 153,724 square feet of event space. Their largest meeting room holds 4,400. We’d love to pack the house at Acumatica Summit 2019! We think the networking and fun that take place at our cloud ERP software event are great incentives to sign up. We also see the training that takes place at the event as the best available; both current and prospective customers especially can anticipate learning with other customers, sharing how they use Acumatica’s cloud ERP software to improve their business processes. Acumatica customer Maxtec traveled from South Africa to take advantage of this opportunity last year. But, no matter how great the practical incentives are, it never hurts to sweeten the deal by selecting an unbeatably luxurious venue, such as the Marriott Marquis Houston. All of us at Acumatica hope you’ll join us at Acumatica Summit 2019. Registration is live, and the early-bird special is active. Feel free to contact our cloud ERP experts with any Summit or cloud ERP software-related questions you may have.